UNFOLDS SECRETS A& THE ESSENCE OF SIDDHA WRITINGS & VARIOUS BRANCHES OF YOGA: KRIYA YOGA, KUNDALINI YOGA, RAJA (RASA) YOGA, SIDDHA YOGA, AMANASKA YOGA, ETC. EXPLAINS THE MEANING AND THE CORE OF YOGA AS AN EVOLUTIONARY PERSPECTIVE, BEYOND RELIGION, THE "NEW AGE" OR OTHER COMMON PERSPECTIVES & DELUSIVE CONCEPTS. The manual for one's sadhana. This book is precious. It is a treasure chest of spiritual knowledge. Each page is filled with information, insight and philosophy of the yogic path. The best is that by reading and immersing yourself in it, in between the lines a tangible energy can be felt. A true gift. This book is amazing, shattering illusions and new age B.S. that is so trendy nowadays. The depth of subjects covered is truly incredible, and I look forward to more surprises as I dive deeper. Even though I know this is the right time, I wish I had started this journey a long time ago! This book is dedicated to the upliftment of humanity. Spiritual awakening is not limited to a certain religion or some particular group of "chosen" people. It is the universal human phenomena of Conscious evolution on earth. This book carries the seed of this awakening. The awakening is not about any spiritual or ritualistic practices, special lifestyle or belonging. Spiritual awakening is about the evolution of spiritual intelligence on earth and a deeper understanding of our bio-spiritual being. This book is about spiritual disillusionment. It is not for a limited group of people. Spiritual awakening is a social phenomenon and has to be addressed as such. It touches upon all areas of life, be it health, education, politics or economy. It's not a book. It's an external representation of the inner guide/guru, a divine gift. The moment I retrieved the book from the post depot and opened it I felt a immediate connection established between me, the book and the power. On auto pilot I immediately started reciting a mantra I never heard before. Very mystical. It felt like an initiation. From this moment on the book has always been there like a guru in thought. The moment you feel stuck the book gives you immediate insight, it goes beyond the written words. Reading this book is like you're guided in deep absorption towards an inner journey of a place/area you haven't been before. Deeper exploration of the Self.The book accelerates all inner processes. Even though I am still at chapter one and rereading it now again and again I realize other things each time. This book is definitely an eternal friend/guru. The book is like the transmissions given by Jivanmukti. Especially the personal transmissions I had before. Each time that I am reading the book is like getting a personal transmission. Also I noticed a shift in the people to who I gave the book to read. People who before where not even that open for spirituality. It's amazing to see how this book can change a person. One last thing that I really admire is the way the book is written: Selfless in pure humble service to humanity, you feel it. 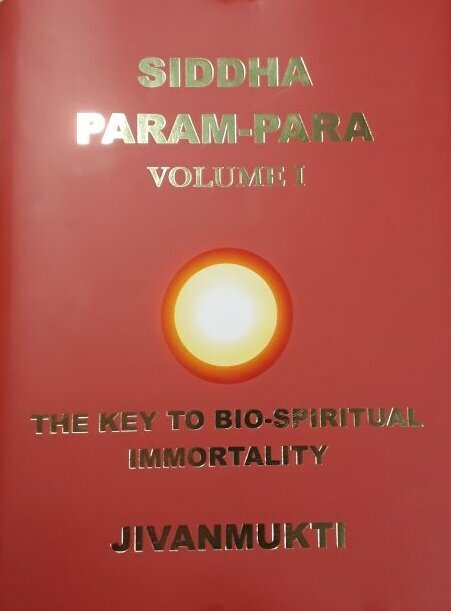 Siddha Param Para, true eternal divine wisdom. Somehow the book arrived yesterday. Kind of miraculous that something can be sent around the world that fast! The presentation and design is incredible, and I can tell that I will be studying this book for the rest of my days. Already the pictures and words transmit their spiritual energy. This book is for all-time. Thank you for the incredible gift. A gift to the world / humanity.